The good news is with treatment and lifestyle changes, many patients with diabetes can prevent or delay the onset of complications. Moreover, some patients experiencing complications can reverse the damage or decrease complications once they have tighter blood glucose control. 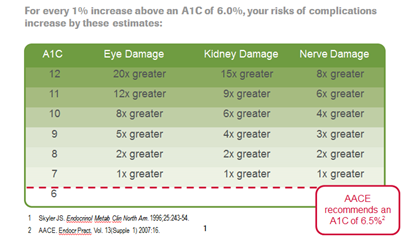 This chart demonstrates the impact that even small reductions in your A1C can have on reducing your risk of developing complications. Note that if you reduce your A1C by just half point or a point, you can drastically reduce the risk of health complications. For example, look at the difference between the risk of complications for a patient with an 8% A1C has drastically less risk of developing eye damage, kidney damage and nerve damage. To help you improve your A1C, we have a Certified Diabetes Educator, Rachel A. Malish, APRN-BC, CDE providing Diabetes Management and one-on-one visits. Rachel has a proven track record of helping patients improve their A1Cs. You have nothing to lose and your health to gain by meeting with Rachel, and your physician will be working closely with her to help get you to your goal(s). Please call (512) 892-7076 to sign up for diabetes management sessions as soon as possible.